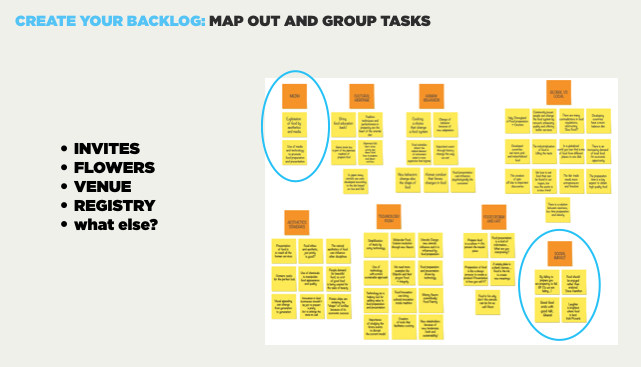 I have no facilitated close to a hundred brand planning sessions, product workshops (across content, UX, marketing, product, design thinking and business strategy), user tests, brainstorms, training programs, Agile classes… the list goes on. And that’s just the past couple years. Many people I have worked with (and students I have taught), have asked me how I do them. In other words if I have a short list of techniques or tools I use. So to that end I thought I’d put a little pen to paper and outline how I do this. These are a few very basic concepts I take into workshops with me. There’s many more but these frame up a majority of how I structure workshops and how I create “learning arcs”. Scaffolding (the concept of starting easy and making it harder as you go along — taking a success oriented approach to learning, so that students achieve as many successes as possible). Sequencing (the idea of concepts and activities building upon each other — learning is about adding layers on top of each other). I do, we do, you do (a “push out” framework of teaching concepts through a 3 stage process). This is a loose structure for how to deliver activities. It’s essentially the “steps” for a lesson or particular activity. This helps me make sure I’m structuring it so there’s a clear beginning middle and end. * I also try to think about and prep teaching moments and points you are trying to drive home during the course of an activity. I call these “provocations”. These are things I think about as I am structuring a workshop (I use keynote often but only as a loose guide — and also so people can see where we are and what we’re supposed to be doing). A purpose — be clear of the expected outcome. Why are you there and what are you there to do? Outline this also in a clear agenda. Show people what a given end result should look like (helps to show examples of what output should look like — this is how they know they are being successful). Show what steps people are going to go through for any activity that requires multiple steps. Remember to mix up individual, paired and group activities. Make some paired and then others team based. 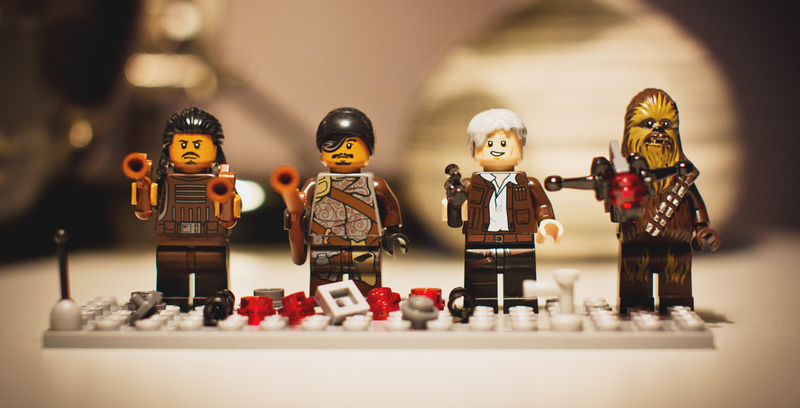 When creating teams, try not to make each team too big (the smaller the team the more participation you’ll get from individuals). 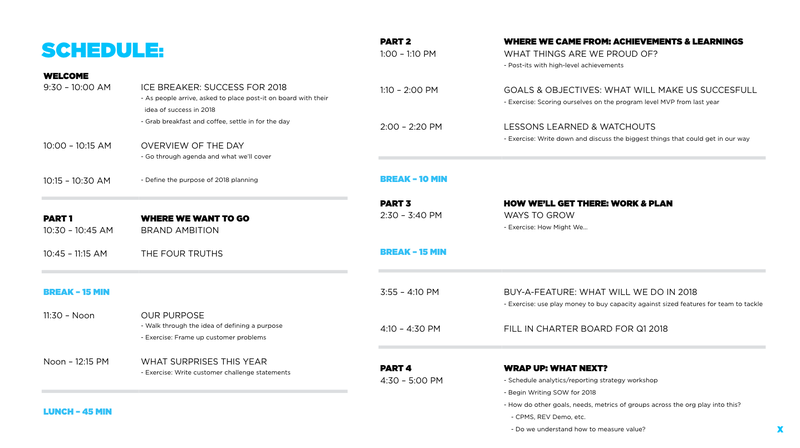 Re: #1 — Sometimes one of the first things I’ll do is create an agenda. This helps me get a high level view of a “flow” (the example below is from a day long yearly brand & product planning strategy session). It can always change but it can show you how things are building off each other and more importantly where you want to end up. Re: #3 — I really do find it very helpful to show what the output should look like. 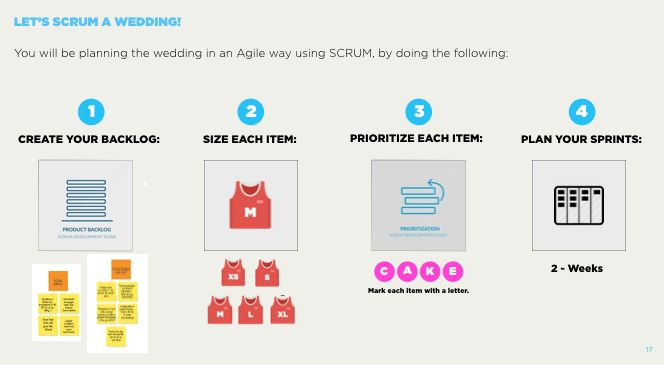 The example below is from my SCRUM Wedding Agile Game I use to teach Agile. For this particular step, the ask is to have people post-up and sort activities for planning a wedding (later they will then take this, size tasks and plan sprints). Re; #4 — Here’s an example (again from my SCRUM Wedding Game outlining the steps people are expected to go through to plan a wedding — each step then becomes a separate time boxed activity). Re: #5 — Here’s a very basic example of what I mean by a template. One Design Thinking activity I have done is to get people to write out Customer Challenge Statements (I created this template and activity as a simple HCD tool and often it’s the place I start). To do this I provide BOTH the template and an example. Re: #6 — Here’s an example of an instruction slide (from Buy-A-Feature Agile game). Not all instructions are this detailed. I’ll leave this on the screen and / or hand this out to a team or set of individuals. From A-C you can see how even there’s tasks within this activity that build on one another. This is a little what I mean by Sequencing. You can also see how I am posing simple questions for people to think about as they are doing this exercise. I customize my games based on the audience and intent as well. One of my basic rules (obviously) is to try not to talk at people but work with them to learn together, reach conclusions together and solve problems together. After all my job is to facilitate, not to lecture. And to not do all the work. 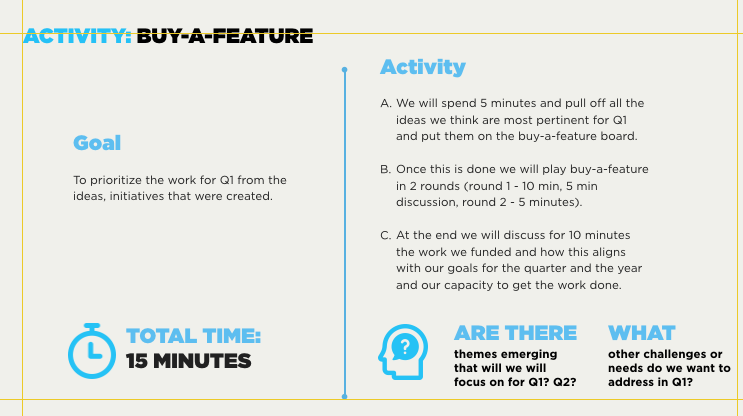 Hopefully this can get you started in thinking about how to structure and run a workshop. Any questions feel free to reply to get in touch. If you would like to know more about running workshops or would like me to run a workshop for you or your clients let me know. I do workshops on: Brainstorming, Brand Planning, Agile & MVP, User Stories and much more.